Category: Promotional Products. Sub Category: CORPORATE GIFTS. 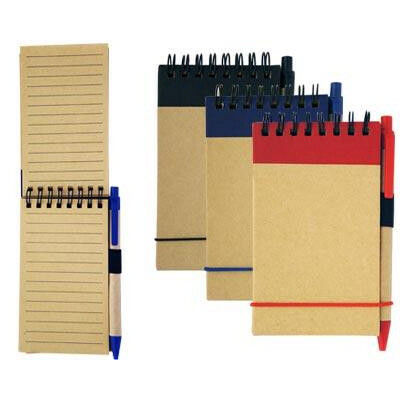 Features: Recycled 80 pages of lined paper with strong cardboard cover. The black ink pen is also made from recycled paper. Print Area: Print Area: 75mm x 55mm. Carton Size(CM): 46x30x33. Carton Weight(KG): 17. Carton Quantity: 200. Colours: Red, Blue, Black.